The ever increasing memory problem and a permanent solution. My laptop, a 5 year old Lenovo G550 was all fine w.r.t space and performance till July last year, until I bought my GoPro Hero3 action camera. 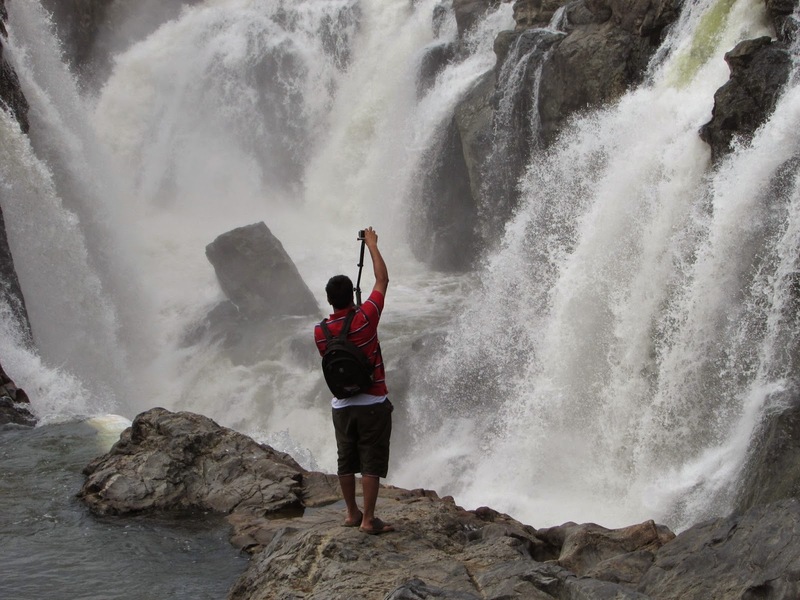 [Related read: GoPro purchase experience * FAQs * Read before buying GoPro] Subsequently during my Thailand, Goa and Jaisalmer trips (and many other trips last year) I shot loads and loads of GoPro footage. These videos, which are as big as few GBs for every few mins of footage began to eat up my hard disc space. Soon, my 500GB hard disc (which was an upgrade from original 320GB hard disc- my laptop’s motherboard design couldn’t accommodate 1GB or bigger HDDs) was not enough. I had to make space by deleting unwanted videos and other stuff, but that wasn’t helping beyond a limit. I didn’t have plenty of time to edit all the videos and retain only very important ones (the low spec hardware was making video editing a pain) and I was not ready to delete footages blindly. End of 2014 this resulted in a situation that all my hard disc, memory cards etc were fully occupied and I had to scramble for space. For a new trip, I would buy a new micro SD memory card (32 GB costs 1k). But this approach was proving to be very expensive. Too many tiny cards to manage and when I calculated cost per GB, it was proving to be expensive. (Refer table below) The other alternative- of burning DVDs didn’t sound like a smart idea. At 4.3GB a disc, the capabilities were very small, when each of my trips would generate content worth 10-15GB. So the only viable alternative was going for an external Hard Disc. During my college days 15 years ago, I had a 40 GB seagate barracuda hard disc. 40 GB feels like nothing today- even micro SD cards have more space. Even a TB doesn’t feel spacious enough. Various storage options and their respective per GB Cost. *Prices are approximate only, based on online shopping sites. Actual price may vary 10-20% based on brand, offers, sellers, variants and other factors. ** Cost of DVD reader/writer extra, not factored. *** Seagate 1 TB HDD had 931 GB of usable memory. Similarly other devices have actual storage some 10% less than their stated capacity. Though there’re many brands, one brand that stands out in hard disc space is Seagate. Seagate has stayed focused on hard discs and other storage solutions, while for many competitors, hard disc is one of the many products in their line up. Reliability is of paramount importance while selecting an external hard disc brand. If the hard disc fails, recovering data is a daunting task. Some shops charge as much as 25000 for data recovery service from a portable hard disc that has stopped working. I am not sure if it really costs that much to recover- several times the cost of disc itself- but given that data inside the disc is priceless, people are forced to cough up. Several years back I had bought a portable hard disc, but that stopped working one fine day after about 2 years- unable to recall the brand- it didn’t have adequate warranty beyond 2 years so I was helpless. After that experience, I wasn’t very keen to buy another USB hard disc. But recently I decided that I should give portable hard disc drives another try. Buying from a reputed brand with adequate warranty, coupled with recent advancements in technology, I hope will ensure longer life span for today’s generation of lightweight portable mass storage devices. Because of the above reason, it is paramount to select a storage device which is reliable and durable, even if it is not the cheapest product in the market. So when I was scouting around for a right brand and product for external storage device, I paid close attention to the latest offerings from Seagate. 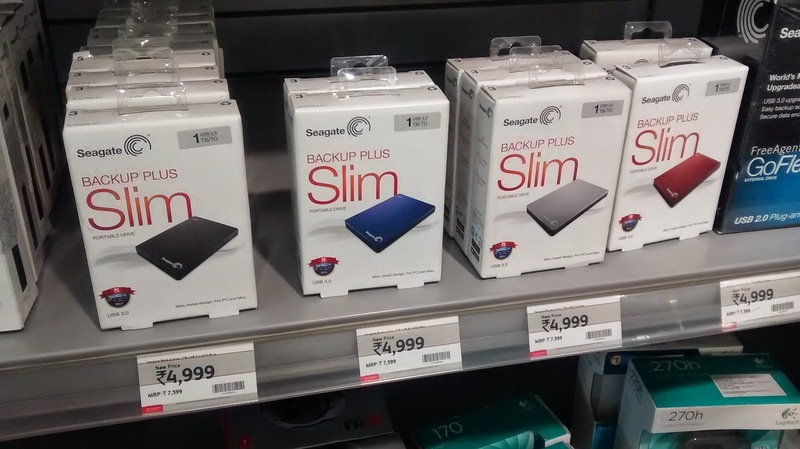 Seagate’s Backup Plus- Slim caught my attention. I began my research on Seagate’s official website- but it wouldn’t reveal the pricing. It would direct me to reliance digital. 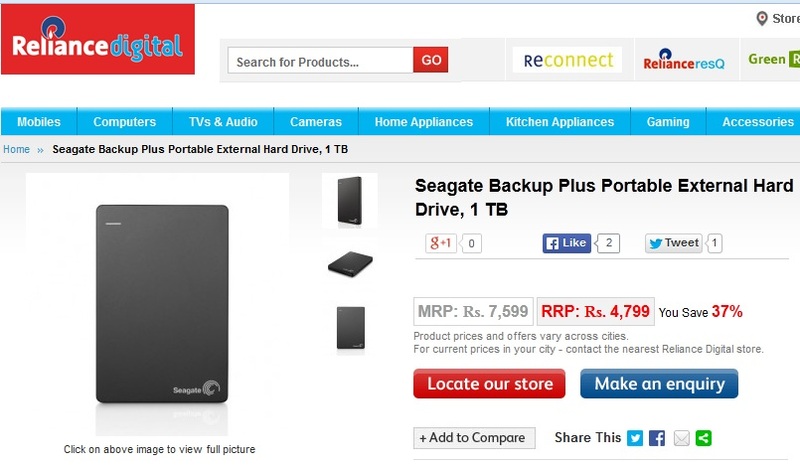 Reliance Digital website listed the price as Rs 4799 for 1TB Black coloured Backup Plus- Slim. But Reliance’s website won’t let me order online. I could make an inquiry or locate their store. I studied its specs and read its review by popular sites like cnet and also by people who have bought this device in Amazon/flipkart. Almost all reviews were very positive about the product and that boosted my confidence and didn't necessitate checking alternate options too much. I found that Amazon was selling the black coloured Seagate Backup Plus slim for Rs 4425. I wanted to check at Reliance Digital before deciding where to buy from. So I went to Reliance Digital’s showroom in Anna Salai in Chennai last Saturday. But there the listed price was Rs 4999 (Rs 200 more than what their website listed) and all the store staff were busy watching CSK vs some team IPL match on their TV, no one came to me asking what I wanted. Twice I gently said 'Excuse Me' trying to get someone to attend to me- no one bothered- either they didn't hear me or assumed someone else will attend to me. I took a walk around the store and then came out. (If Reliance Digital Management is reading this post, watch CCTV footage in your Anna Salai store for Saturday, 11th April. You will notice all staff staring at TVs screens full time during match hours). Nearby Tata Chroma was selling same device for Rs 5075. If the difference between online and offline was within 100-200 Rs I would have probably bought on the spot, for the convenience of not having to wait till the online order arrives. But the difference between Amazon and Reliance was about Rs 600, so I came back that evening and ordered online. Same night, Amazon mailed me that order has been shipped. By Monday evening, within 48 hours the device was in my hands. Seagate had few other variants listed on its website, such as Backup Plus Fast, Wireless Plus etc. These have some unique advantages but are a bit expensive compared to Backup Plus slim. Coming back to Seagate Backup Plus Slim, I find it very handy and convenient. It is not big and bulky- because it is super slim, just the size of a smartphone, it fits into my bag’s internal pouch very easily. 1 TB space (the device has only 931 GB of usable free space, not exactly 1024 GB) means I can now afford to clean up my hard drive, memory cards and pen drives, organize my photos and videos in the way I chose- all in one place, not scrambled across different drives/folders/devices due to shortage of space. This means my video processing will now be faster, as video editing tool can have max possible disc space on primary hard drive. This also means now I can make the full use of my camera- I can shoot pictures in highest possible resolution, without having to worry about space. 3 years warranty means peace of mind. Overall, I am now feeling empowered with my current need for space satisfied. A cheaper solution would be to buy the hard drive and USB enclosure separately. It won't look as good as the ready made ones, but work just as well. If your laptop/desktop doesn't have USB 3, there's no point buying a more expensive HDD, just get the cheaper USB 2 version. 3.5" (desktop size) HDDs typically not only cost less than 2.5" (laptop size) ones for the same capacity, but also have faster transfer rates. They are just a bit more bulky. So, the most economical way for external HDDs is to get a 3.5" hard drive, and buy an enclosure for it. BTW instead of backing up videos to paid cloud services, you can upload them to YouTube as private videos. It's free, and has unlimited storage. Of course you'll need a fast internet connection for them both, which cannot be guaranteed when travelling. thanks for the detailed comments. I have memory cards worth 150GB, so won't need portable HDD for short-medium trips. Will be careful not to drop it or pack in such a way that it is cushioned. Youtube upload will take days, as videos are in GBs.. not a practical solution. Nowadays there is a huge variety of external storage systems like removal hard disks which are of a large space. Hence, it becomes easy and convenient to bring along additional storage space whenever you get out of the house.